Pens: Hand cut goose quills, pointed metal nib. Inks: Ian the Green's Iron Gall; John Neal's Walnut Crystal; Winsor & Newton's Crimson, Blue, Green & Yellow inks; Purple Gouache; Garlic Juice. Wait, a Middle Kingdom Award? You might have seen me mention Ian the Green a couple times on this blog. If you participate in any of the scribal communities on Facebook, you've probably seen his posts as well. As a fellow scribe, ink maker, and author of a blog called Scribe Scribbling, Ian's been an inspiration to me despite being from the Midrealm... I made mention of wanting to do a scroll with mistakes on it a few months ago, and Ian replied saying how much he would love to receive a scroll like that: Challenge Accepted! I contacted the Dragon Signet and asked if I could be the scribe for his next award. She was thrilled that I asked, and contacted me a few weeks ago with the assignment. Ian was to be awarded the Purple Fret for his service to the A&S community. Somewhere in the British Isles, on a cold winter's day, a monk was tasked with making copy of a Domesday Book for his Monastary that recorded the deeds of members of the Midrealm. The stars were not aligned for him on the day he copied this particular page, and his work with littered with mistakes and blemishes. 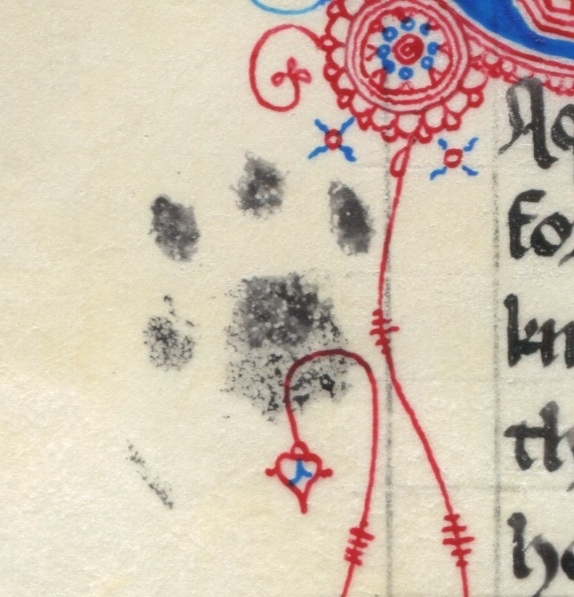 It was still good enough to keep, so he made some comments in the margins to vent. 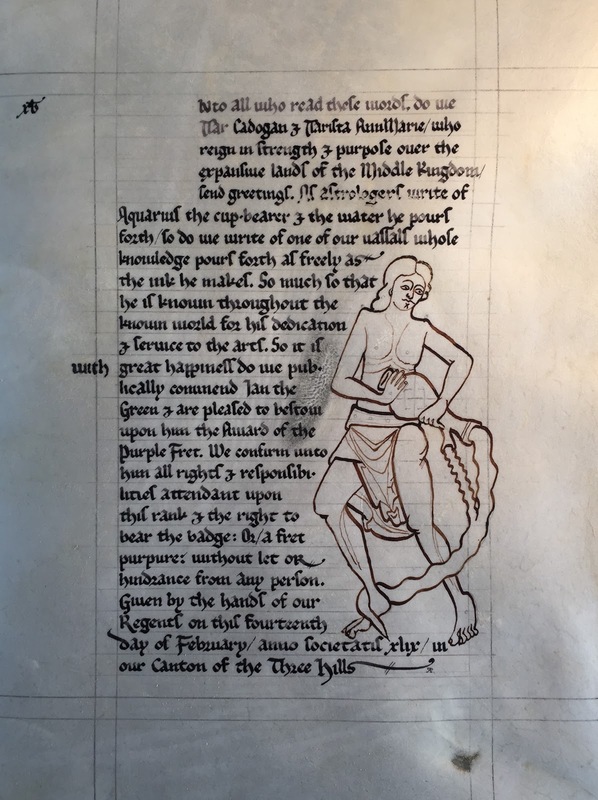 My challenge was to make a beautiful scroll that was not overwhelmed by the mistakes, but to still have fun with them in a way that Ian, a fellow scribe, would really appreciate. Step one was of course to find inspiration to base my design off of. I also needed some way of including the symbol of the Purple Fret in the design. A few searches for Domesday books near the home and time period of Ian's persona led me to the Early Manuscripts at Oxford University page. 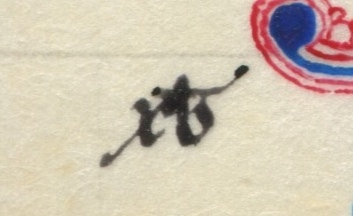 I started browsing through the manuscripts that were 12th/13th century to find some that spoke to me. 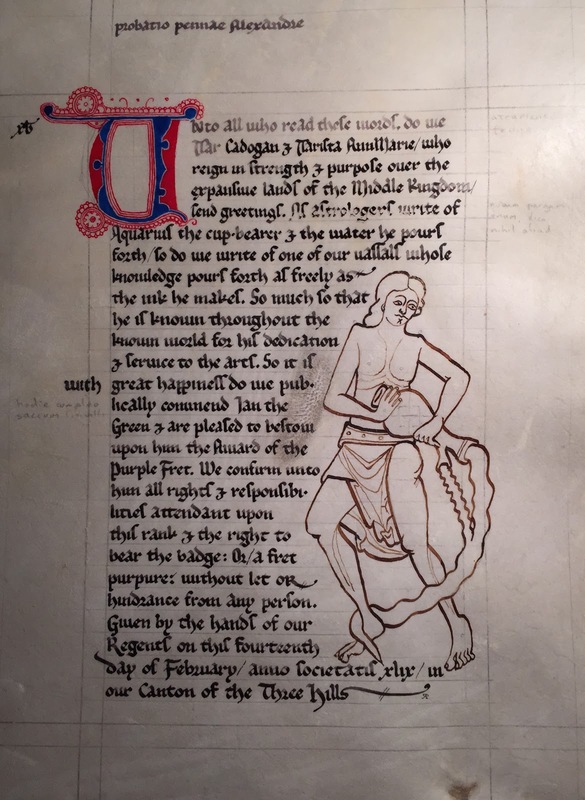 The first inspiration was Balliol College, MS 350. 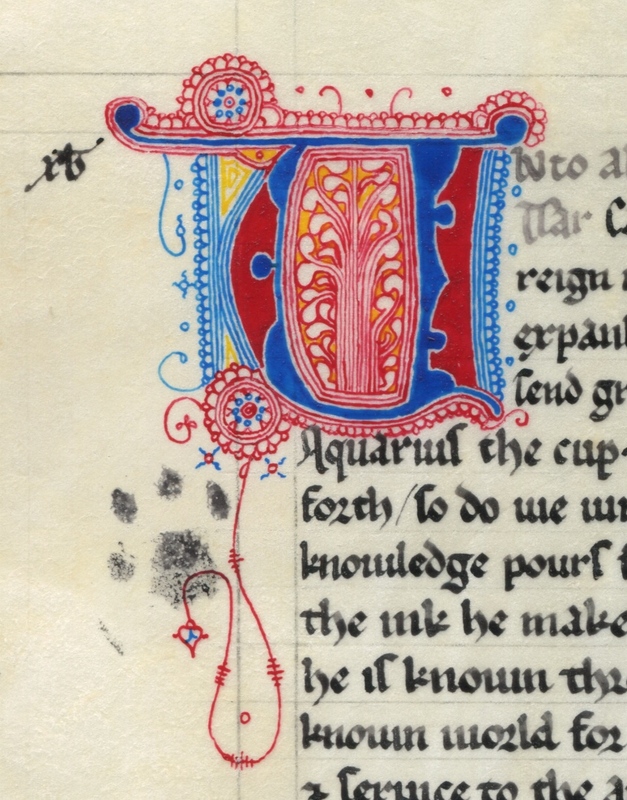 I loved this particular proto-gothic hand, and the puzzle initials. It also had a few pages with marginalia. As I continued browsing, I came across this image of Aquarius. The pouring imagery just fit with Ian's ink making, and led to the inspiration for the wording as well. I also realized that the urn could be used to display the Purple Fret symbol. Finally, after writing the words, I wanted a good example of a Puzzle Initial U to use, so I found this one at the Puzzle Initial Index. Having found my visual inspiration, I started this assignment by writing the words. Once complete and okayed, I began my standard process of learning the hand and figuring out sizing. An AMES setting of #5 on the 3:5 scale worked to get me the letter weight and line spacing I wanted. I planned on using a 9x12" sheet of parchment. 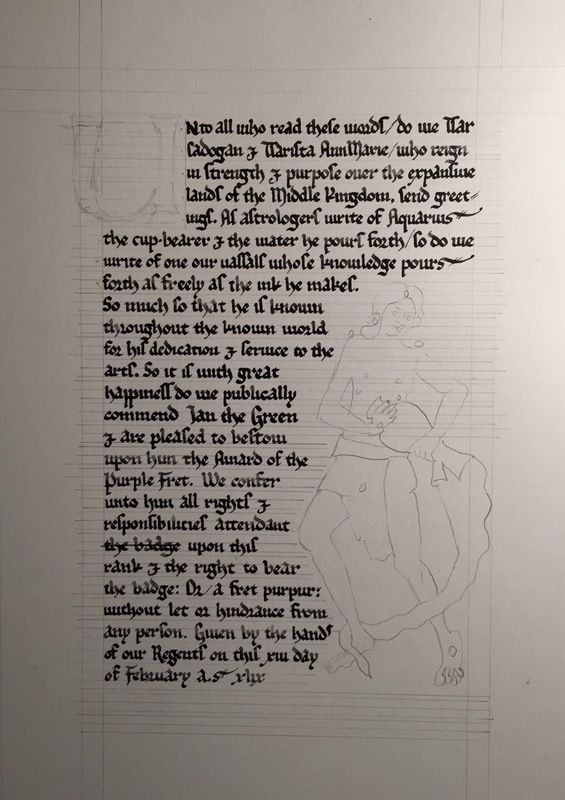 Subtract a 1" margin for framing, and another 1" margin to fit the marginalia commentary into, and I was left with a calligraphy space of 5x8". 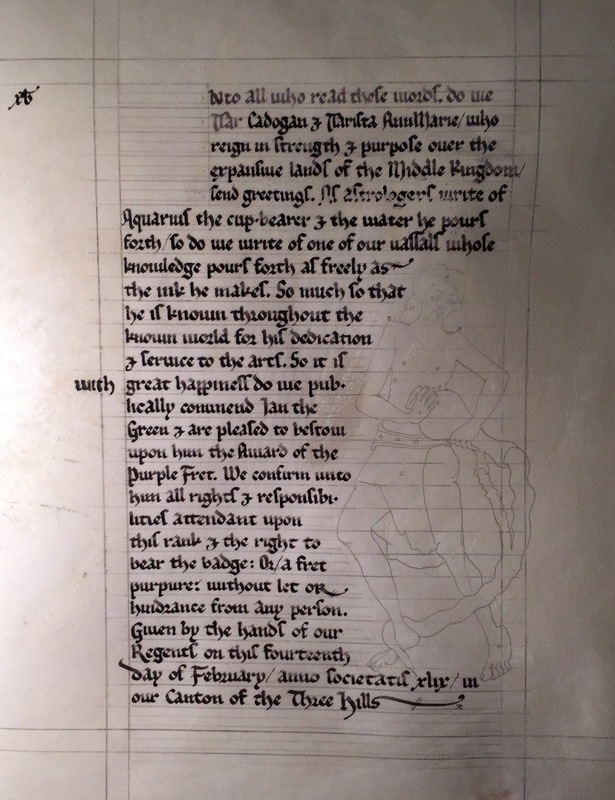 I estimated the text layout on the computer based on my practice, but I wanted to be sure the text would fit around the figure of Aquarius and end near the bottom of the page. The only thing to do was write it out on a piece of paper to make sure I had the spacing correct. Practice complete, I prepared my parchment by pouncing with powdered pumice and gum sandarac, then added the lines. I started by adding the left, right and top margins with my lead-tin plummet. Using a light box, I drew in the figure of Aquarius, then used the AMES guide to pencil in the calligraphy guidelines. I added the final lead-tin lines over every third line left by the AMES guide. Next came the final calligraphy, done with Ian's own ink. The calligraphy in place, I switched to a thinner quill and walnut ink to draw in the figure of Aquarius. With a pointed metal nib, I started adding the puzzle initial. 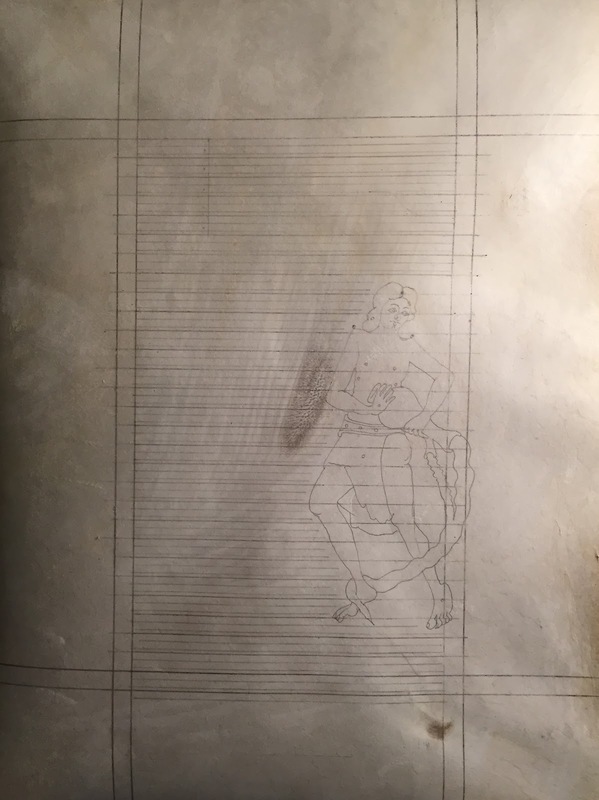 With pencil I started planning the location of the marginalia. Puzzle initial complete. I used garlic juice to adhere the gold-leaf. 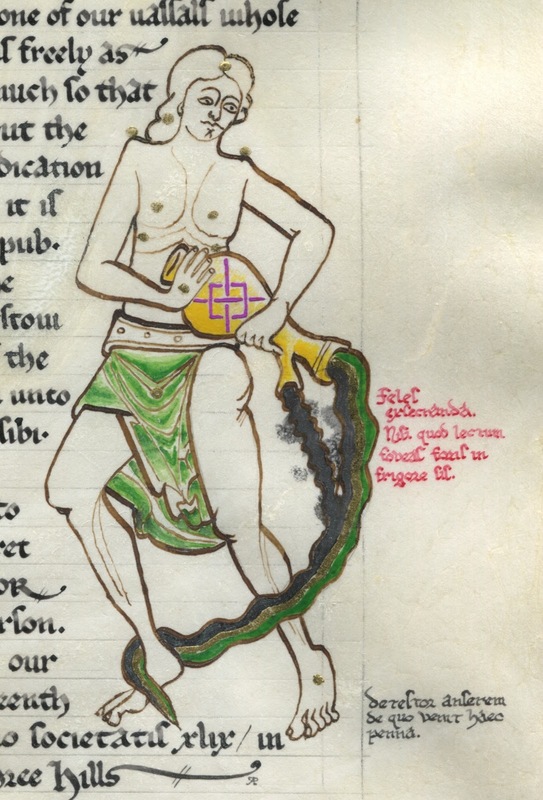 The green of Aquarius' loin-cloth was done with a pointed pen. I started with green ink straight from the bottle for the darkest areas. Then I swirled the tip of the nib in water to dilute the ink and blended out from the dark areas. I continued to dilute and blend out. Finally I finished Aquarius and added the cat print and marginalia. The idea for the mistakes and marginalia (the comments in the margins) came from a number of sources. 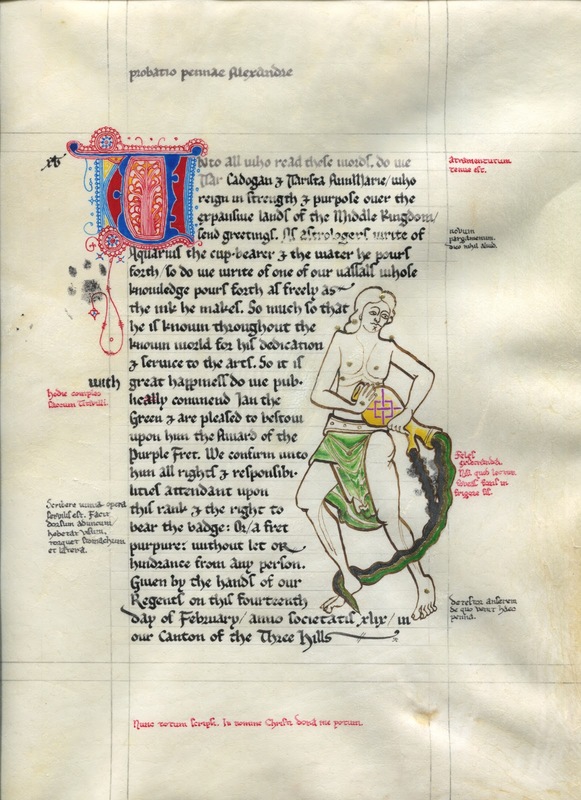 Marc Drogin's "Medieval Calligraphy" has a chapter that talks of Titivillus, the patron demon of calligraphy. Erik Kwakkel writes of commentary in Voices on the Medieval Page. Maria Popova writes of commentary in Oh my Hand. 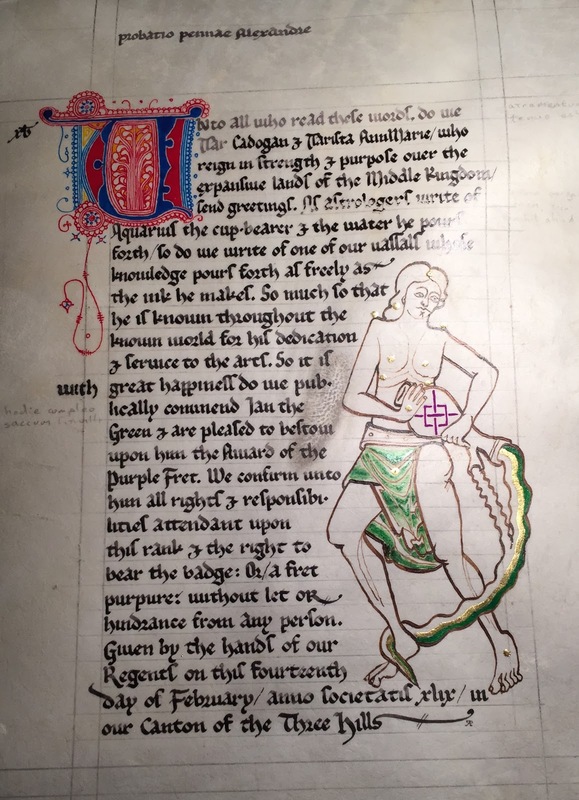 Victoria Lord writes about pen tests and other commentary in The Medieval Scribe and the Art of Writing. I planned each mistake and comment, and had them translated into latin by the talented Master Steffan ap Kennydd. 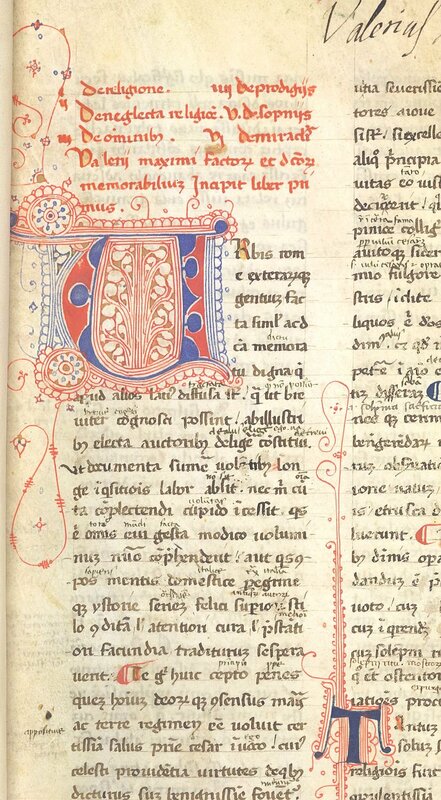 probatio pennae Alexandre - "the pen test of Alexandre"
xb - Abbreviation for Christe benedic, a written prayer asking for Christ to bless the scribe's work. Atramentum tenue est - "the ink is thin". Penned with a thin batch of Ian's own ink. Novum pargamenum. Dico nihil aliud. - "New parchment; I say nothing more." 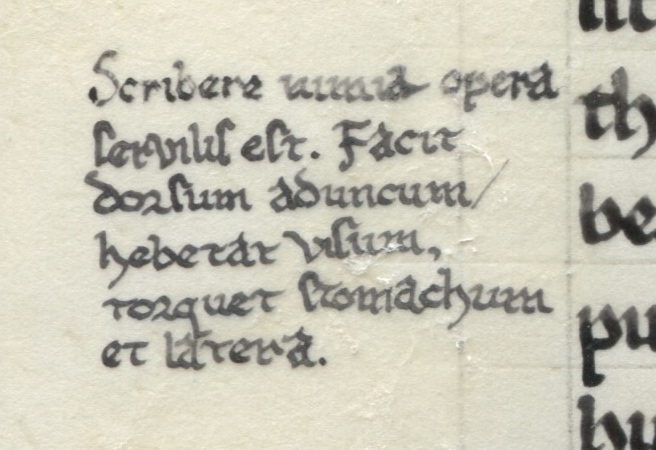 I rubbed this area of the parchment with oils from my skin, which caused the ink to bead up as I wrote. Hodie compleo saccum Titivilli. - "Today I fill Titivillus' bag." Ironically enough both the missing word and mispelling were completely unintentional! I was planning on including them a couple lines later. In my planning ahead I must not have been paying enough attention to what I was doing at that moment, and it worked out perfectly. According to Drogin, Titivillus was said to collect the mistakes of the scribes in a bag, and carry them down to hell where they would be recorded in a book next to the name of who made the mistake. Feles exsecranda. Nisi quod lectum foveas foris in frigore sis. - "Damn cat! If you didn't warm my bed, you'd be out in the cold!” I cut a cats paw shape out of a sponge and used it to smudge the wet ink flowing from Aquarius' pitcher. Detestor anserem de quo venit haec penna. - "Curse the goose from which this quill came!” A random complaint about the quill acting up. No specific mistake associated with it. Cat footprint just under the initial, I added a touch more ink after smudging before placing this. Scribere nimia opera servilis est. Facit dorsum aduncum, hebetat visum, torquet stomachum et latera. - "Writing is excessive drudgery. It crooks your back, it dims your sight, it twists your stomach and your sides.” A period marginal quote about the trials of being a scribe. Nunc totum scripsi. In nomine Christi dona me potum. - "Now I've written the whole thing; for Christ's sake give me a drink." Another period quote, and sentiment we can all agree on from time to time! Finally, a detailed photo of the puzzle initial. I based these off of the Midrealm scribe's handbook example, and then made some modifications. Unto all who read these words, do we Tsar Cadogan and Tsarista AnnMarie, who reign in strength and purpose over the expansive lands of the Middle Kingdom, send greetings. As astrologers write of Aquarius the cup-bearer and the water he pours forth, so do we write of one of our vassals whose knowledge pours forth as freely as the inks he makes. So much so that he is known throughout the known world for his dedication and service to the arts. So it is with great happiness do we publicly commend Ian the Green and are pleased to bestow upon him the Award of the Purple Fret. We confirm unto him all rights and responsibilities attendant upon this rank and the right to bear the badge: Or, a fret purpure; without let or hindrance from any person. Given by the hands of our Regents on this fourteenth day of February, anno societatis xlix, in our Canton of Three Hills. I'm really happy with how this came out, especially considering how quickly I had to put it together. I only had a couple weeks to finish it and get it in the mail so it would arrive on time. It even went a little faster than planned. It was fun to design and execute the whole scroll. Calligraphy may be my passion, but adding some more decorative elements is fun too. Quills are getting easier to cut, maintain and use, though I'm still struggling to get the supremely fine hairlines I see in many period examples. Above all, I love the fact that I got a chance to do this for a friend. Thanks Ian, keep on scribing.